The Eventing Season is Coming! 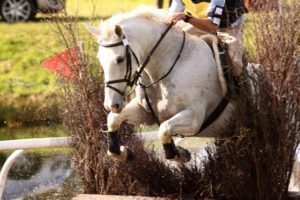 The Eventing season is fast approaching, and you can feel the excitement building in the Eventing world! This year is my first year after many where I won’t be joining in with all the excitement. No Eventing for myself and the big grey bog monster that is my horse (He’s loving this idea by the way, out in the field getting fat and muddy!). But I’ve found myself at somewhat of a loss, normally at this time of year I’d be spending endless evenings and weekends getting my horse fit and planning what events I’d want to do. 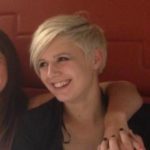 This inspired me to write about what I’d normally do in the forthcoming months and weeks planning for the season. Trying to fill the void from not joining in! My wall planner comes in the post and so it begins for another year. All those events are laid out in front of me on the kitchen table, I’m ready with pen in hand, highlighting events furiously as I go. There are many things I consider when planning. First, choosing when my first event is to be. 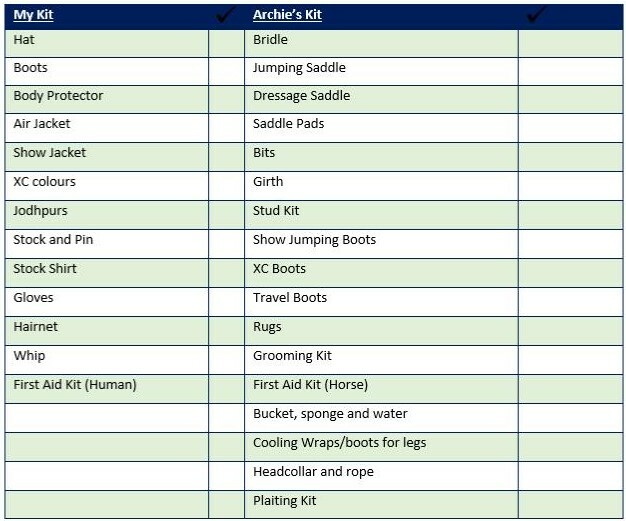 I need to make sure I’m confident that Archie (the horse) will be ready by then. Next is checking the lorry driver’s diary (Also known as Mother) and what dates she can and can’t do. I also check Archie’s diary and see what appointments he has coming up, such as the farrier, dentist or chiropractor etc. making sure they don’t clash, and it won’t affect his performance. Lastly, I pick an event I’d like to aim for, either in a qualifying event or an event to move up a level, so I have a goal to aim for. Organisation is key! I’ll admit that I never stick to the original plan, but I like to start off with good intentions. Once all the planning is done, the wall planner is pinned up for all to admire. To make sure I always have this information at my fingertips I transfer it to my phone. Using equine apps designed for horse diary’s makes it easy to coordinate both Archie’s everyday diary and his Eventing one. Archie seems to know when the fitness regime begins for the eventing season each year. He stands in the furthest corner of his field, plastered in mud and looking fatter than ever. I scream his name from the gate, desperately trying to convince him that he wants to come in. He just stands and blinks at me in disbelief that it’s that time of year again already! After dragging him in and getting him clean as I can, it’s time to start clipping. At the start of the clipping process Archie looks like a polar bear, by the end of it the one who ends up looking like a polar bear is me. Once this is all done the hacking starts. To begin with myself and Archie have many arguments as to whether going on a hack is a good idea or not. But once we’re through this phase we spend a good four to six weeks hacking. Gradually we increase the intensity of the hack. Four: Warm up walk and walk breaks, plenty of trotting and introducing some canter work. Also, in this week we re-introduce Archie to the school. Six: The fast work increases and jumping sessions become a regular occurrence. A proper Warm up and down is crucial for keeping Archie in good nick and feeling well. All this done and hoping everything has gone to plan Archie should be in pretty good shape and looking less like a whale. Archie’s weakest discipline is show jumping, so in the run up to the eventing season a large portion of our time is doing gymnastic exercises, grid work and going out to small show jumping competitions. As the winter months draw on, and fingers crossed that the weather gets better, we find a weekend to do some cross-country schooling. 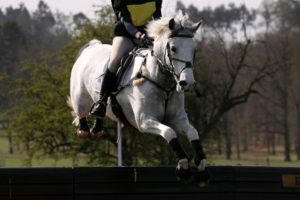 If we struggle to find a cross country course open due to weather, we’re luckily not far from an equestrian centre that accommodates an arena eventing course. No doubt that I’ll forget something and must make do or borrow off a fellow competitor. I’ve located everything and placed it in the appropriate place, time to walk the course. Walking this first course of the season suddenly throws doubt in my mind. I walk up to a fierce looking cross-country jump, normally around the 4th or 5th one. I think to myself “I’m sure the jumps weren’t this big last year, that can’t be the right height!”. Nether the less I continue, taking photos as I go. I’ll look back at them later, reducing the risk of me forgetting my course (this isn’t guaranteed though). With both my show jumping and cross-country courses walked there is nothing left to do but learn my dressage test off by heart. We’re all ready for our big debut! I’m so excited to get going again! Archie on the other hand, not so much, after being scrubbed clean and made to stand still to have his plaits put in. The next morning, everything is packed, Archie has been scrubbed once more after sleeping in the biggest poo stain he could find. He’s now happily on the lorry, eating hay. I jump in the lorry and away we go, raring and ready for the Eventing season to commence!